Situated in a provincial park, this hotel is 0.1 mi (0.2 km) from Cigoland and within 3 mi (5 km) of Saint Georges Church and Sainte Foy Church. Top places in France: Alsace. Opens in a new window. Where to find Selestat hotels near an airport? Where can I find hotels in Selestat that are near tourist attractions? For tourists planning a trip to Alsace-Lorraine and are after an Expedia-listed room in Selestat, there are a few nice options. Within a 0.1-kilometre (0.06-mile) distance of the downtown area, you can find 6 Expedia-listed accommodation options. 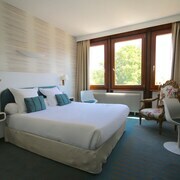 There are not many hotels to choose from within easy walking distance from the center of Selestat. The Hôtel Majuscule is a good option as it's just 3 kilometres (2 miles) away. A very good area to check out is Barr. Barr is 18 kilometres (11 miles) from the center of Selestat and has 3 Expedia-listed hotels. 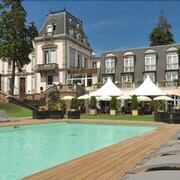 Some good accommodation options in Barr are the Hotel Restaurant les Hortensias and Hotel Le Manoir. Another option is Le Hohwald. This accommodation district is 20 kilometres (12 miles) from the middle of Selestat. 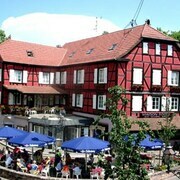 There are 5 places to stay in Le Hohwald, including the Le Grand Hotel Du Hohwald and Marchal. Alternative accommodation neighborhoods include Ottrott and Urmatt. 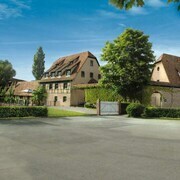 The Hostellerie des Châteaux & Spa and La Résidence des Châteaux are in Ottrott, while Urmatt is where you'll find the De la Poste and Le Clos du Hahnenberg. 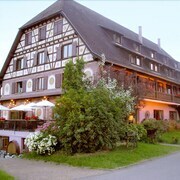 The Hôtel Restaurant Au Parc des Cigognes and Hôtel Cigoland are situated in Kintzheim, while Domaine le Moulin and Le Clos des Délices are part of the Saint-Nabor area. 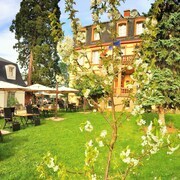 The Le Grand Hotel Du Hohwald is nicely located 19 kilometres (12 miles) from the central part of Selestat and is an ideal choice for visitors who like to stretch their budget. You might also like to look at the Marchal. You could also check out the Europa-Park Freizeitpark & Erlebnis-Resort, Hotel El Andaluz and the Europa-Park Erlebnis-Resort, Hotel Castillo Alcazar. The Europa-Park Freizeitpark & Erlebnis-Resort, Hotel El Andaluz can be found 19 kilometres (12 miles) from downtown Selestat. The Europa-Park Erlebnis-Resort, Hotel Castillo Alcazar, is 19 kilometres (12 miles) away. Other Expedia-registered hotels include the Europa-Park Freizeitpark & Erlebnis-Resort, Hotel Bell Rock and the Europa-Park Freizeitpark & Erlebnis-Resort, Hotel Colosseo. The wider Alsace-Lorraine region is definitely well worth exploring also. Alsace-Lorraine is marked by rural landscapes, and common Alsace-Lorraine destinations include traditional villages, old towns and war relics and monuments. In this part of France visitors can partake in mountain climbing, hiking and cycling. 40 kilometres (26 miles) from Selestat is Strasbourg, home to the Strasbourg Cathedral and Tomi Ungerer Museum. 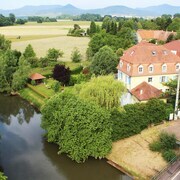 The Hôtel Les Haras and Hotel Cour du Corbeau Strasbourg - MGallery Collection are some of the fabulous Expedia-listed lodging alternatives in Strasbourg. Or stay in Strasbourg, 40 kilometres (26 miles) to the northeast of Selestat, where you can choose from the Régent Petite France & Spa and Château de l'Ile & Spa. The Covered Bridge and Rohan Palace are just some of the more popular points of interest to explore when you're in Strasbourg. Strasbourg International Airport is a convenient airport for flying into Selestat. It is 35 kilometres (21 miles) away. If you plan to stay nearby, try the Roi Soleil Strasbourg Aéroport Hotel or Appart'City Strasbourg Aéroport. What are the most popular Selestat hotels? Are there hotels in other cities near Selestat? 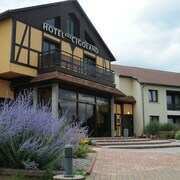 What other types of accommodations are available in Selestat? 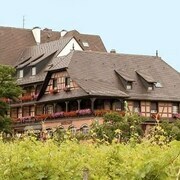 Explore Selestat with Expedia.ca’s Travel Guides to find the best flights, cars, holiday packages and more!